Ok, hands up whoever has faced this problem of laziness before. Picture this. 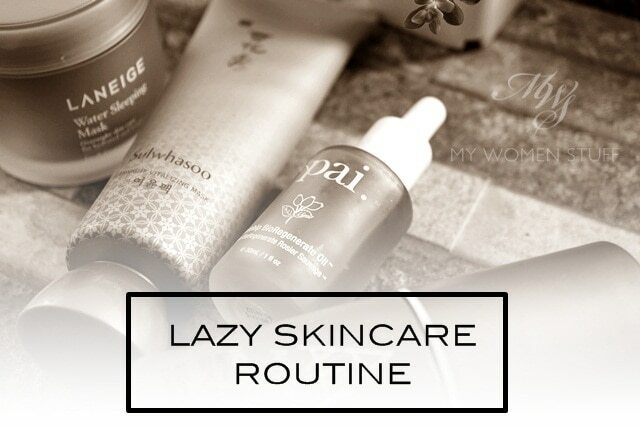 You come home late from either a long day at work, or a party, or a meeting, or you just feel lazy that evening as you stare at your skincare arsenal, thinking of the multiple steps you have ahead of you. All that spritzing, massaging, lotions, potions…. When all you want to do is to just shower and get into bed and let Mr. Sandman do his job. Do you drag yourself up, tell yourself that you can’t afford to be lazy, and go through your whole skincare routine? Do you think “Oh sod all this!” and just crawl into bed and hope for the best? What will YOU do in this beauty scenario? I get those days when I don’t really want to go through my whole skincare routine. It might not be very long, but it’s just 5 minutes too long for me. Some days, I just want to say “Sod it!” And I do. Well, not 100% of course. I will do the basic minimum which includes double/triple cleansing and taking a nice hot shower. No matter how tired or exhausted or how late it is, I never ever skip the cleansing bit. Nor a shower. But what comes after that, I cheat. I call these my “cheat days” – those who are on some diet or another will have their cheat days right? Well, I have my skincare cheat days. On my cheat days, I usually head straight for a leave on mask. But sometimes I skip on the Liquid Gold and on really lazy days, I pick up one of 2 sleeping masks I use most frequently. I’ll have a review of the new Laneige Water Sleeping Mask coming up soon (or you can read the one on the previous formula), but in a nutshell, it’s one of the better hydrating masks I’ve used still. So, I still reach for it when I’m too lazy to run my skincare routine, but want a boost of hydration. This gives me that boost. But when I’m feeling tired (and it shows on my skin) then I invariably reach for the Sulwhasoo Overnight Revitalizing Mask which does wonders for my tired skin. A thick layer of product goes on my skin, I collapse into bed and wake up looking rested. This is my “secret weapon” which isn’t much of a secret anymore is it? I whip it out on days when I look like crap and feel like crap and the good thing is that I don’t wake up looking like crap, which is one level of crap better LOL! Another “secret weapon” I have is the Pai Bioregenerate Rosehip Oil, which I use in conjunction with a rose floral water. I spritz the floral water all over my skin, then apply a generous amount of rosehip oil while my skin is still damp, and massage it in. This is a little messier and takes a little more effort than the Sulwhasoo mask, but gives me a wonderful result in the morning. My skin feels softer and looks better. I’ve got the lowdown on how well this works for me if you read the review so I won’t repeat it here. Do you have skincare cheat days and what do you use for your lazy skincare routine? NEXT POST: In the mornings, when I use this Antipodes cream cleanser, my skin sings Hallelujah! I don’t cheat on my actives nor my cleansing routine.. but I sometimes do as you and pick a moisturizing product.. be it an emulsion, a serum, an ampoule, or a sleeping pack, lay it on thick, and go to bed. As I usually take my shower late (usually before sleep, bad, bad habit, haha), I will cleanse my face with Bobbi Brown Cleansing Oil then slap on my night cream (whichever is the current product). I like a hydrating night cream because it feel so nice on skin when I go to sleep and it’s my must-have for travel skincare (no need to get heavier moisturizer as one jar usually last about 3 months and my travel usually last 1 – 2 weeks only). Eeeh where do you get your Filorga Meso mask, Fatimah? I’ve been very curious about it because I hear it’s amazing! The good thing about having cleansing wipes and bioderma at your bedside table or anyplace near it is that you will always go to bed with a clean face, even on those super-lazy and exhausted days. On these days, I just wipe with a cleansing cloth/wipe, then biorderma and lastly, a thick layer of oil (usually Sunday Riley Juno or their body oil -yes on the face). Minimal but works for me. The thought of going through the whole cleansing routine with cloths and stuff will never cross my mind on those kinda days lol..
hahahhaa I couldn’t do the cleansing wipe + bioderma thing. I don’t even have any cleansing wipes! Not because I subscribe to the theory that it’s not good for your skin, but just because I erm… don’t have any LOL 😀 I suppose I do still cleanse because often, I hop into the shower before bed so since I’m already getting wet, washing my face isn’t an issue. But the oils, yeah they’re one of the quickest ways to get the skin back on track eh? I’ll get Juno next time. Still waiting to test Luna! Depends, if I still have teeny weeny energy left after my shower, then a quick rub of hydrating serum and moisturizer will do. But if I’m dead tired, then everything can wait till tomorrow. Bad, I know. I will never skip double cleansing and a shower no matter how tired I am. And my cheat product is always a sleeping mask. My favorite is Glamglow Thirstymud. Hydrates and plumps my skin the next day. Not to mention the baby skin feeling when washing it off. Right? there’s something so comforting about a hot shower especially when I’m tired. It helps me sleep better and more comfortably too! The Glamglow mud mask is a leave on mask?! I was trying this Glamglow mask (white tub) that I came across in my stash and my face feels like it’s frozen if I leave it on for too long! Ah! No wonder when I left it on for about 40 mins, my face felt like it was about to fall off LOL! I too followed up with a hydrating mask. My skin was literally calling out for it! I’ll take a look at the blue tub next time. It sounds interesting. I mean, a mask under makeup?! It’s nothing I’ve ever thought about before this! Can’t wait to see your review on Thirstymud 😀 I have tried Laneige and Origins overnight mask, and find that Glamglow one is the most moisturizing among them. Although it is also has the longest time to sinks into the skin. Wah you eve do eye serum! LOL 😀 I barely remember eye cream even on non-lazy days. I really should be more diligent! Me! I use Laneige Water Sleeping Pack. I have finished two tubs of that and am on my third. I do not own the other products featured by you. Hope to try them someday. PS: I just bought the Caudelie Oil. Hehe. MWS is good for me. Hardly anybody ventures near Sulwahsoo. =P I am not too keen to walk near their counter! LOL! Maybe when I empty my Laneige and many other sleeping masks in my stockpile, I will move on to Sulwhasoo. Sulwhasoo is too pricey for the average folks. I would probably get it once and cannot maintain, so I might as well not go near. When I’m lazy, I’m really lazy. Lazy is too tame a word on those days. I’d best describe as a giant sloth! I would just cleanse my face and apply my Laneige Power Essential Skin Toner (and spot cream if I have any). That’s it! I ALWAYS double cleanse before I go to bed, because I work at night and I wear makeup to work. So cleansing is a must. But if I am too tired for anything else, I just spritz my rosewater with glycerin and I am done. My skin (which is typically combo-dry) is moisturised. I don’t do this very often though, so I make sure I go through the whole normal routine the next night. Micellar water, wash face with cleansing balm followed by spray toner and moisturiser. I try and do a mask the next day to make up for it. The full monty is triple cleanse, tone, serum, moisture and some oil mixed in. I’ve got some wipes somewhere as I bought them for the plane but I’m not convinced. Do they even bio-degrade?! Wow, that’s still 2 more things than I’ll do! Good on ya 😀 I don’t know about wipes, to be honest. I’m not anti-wipes the way some people are, but I just realised that I don’t really use them. I think it’s because when I tried some before, (I used to use Simple – fairly affordable and gentle) I’d find they were a bit rough once you get scrubbing at the skin. But I can’t deny they’re great in a hurry! Great post! I had my cheat day yesterday with Alpha-H Liquid Gold as I was tired too. 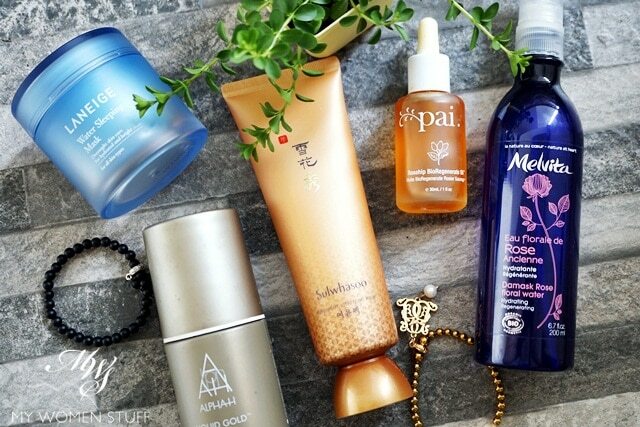 I must try the 2 masks you mentioned in this post since it gets so many raves everywhere. They do not stain your pillow cases right? Ah hah!! Yes skincare cheat days! Now I can be less guilty when I do so haha. I personally think the Kiehl’s overnight hydrating mask is awesome!!! Then of course, the price is double of the laneige’s. ??? ?